FlexPower's advanced feature set is designed to provide greater product reliability, increased flexibility, shorter install time, a smaller service inventory, and an intelligent, economical solution to the problem of reliable system power. 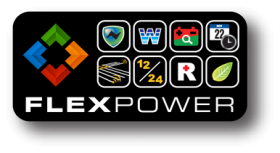 LifeSafety Power’s leading edge FlexPower products are designed to work seamlessly together to deliver a new level of quality, performance, and system flexibility. These DC power supply configurations are standard stocked models offered with single, dual, and triple voltage output intended to be used as general system power supplies for what ever purpose is needed. Typically used by a systems integrator to simultaneously power access control locking devices and CCTV cameras and /or domes from the same enclosure, these units are available in several different configurations and zone capacities. Standard power configurations for four, eight, or sixteen door access control systems allow the integrator to power the control panel, locks, and auxiliary devices such as REX detectors, timers, and readers with one enclosure level product. Building block parts availability enables field expansion of system capabilities and capacities. Increase power levels, expand output count, add features to an existing system, without agency listing issues. Expand fire alarm signaling capability to meet ADA requirements. Provide strobe sync, sync follower, and temporal coding. Expandable Power Systems combine two power supplies in a larger E2, E4 cabinet for fully configurable, infinitely variable models, Listed expansion modules include: power distribution, lock control, egress lock control, secondary voltages and network connection. NetPower MidSpan injectors enable remote power for a wide range of end point devices. NetPower PoE extractors extract PoE power and deliver regulated 12VDC power for any secondary non PoE device.